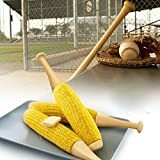 If you love eating corn on the cob, but don't enjoy burning your hands trying to pick it up, then forget sticking in the typical boring old cob picks on each side and check out these cool new Baseball Bat Corn On The Cob Holders instead. That's right sports fans, these fun corn holders transform an ordinary corn on the cob into a miniature baseball bat that you can either swing around like a baseball bat or just munch from single-handedly. They feature a baseball bat handle for one side and an end cap for the other side and come in a set of two. Sure to be a homerun with kids and baseball-loving hungry adults alike.